What if you could refuel your car at a restaurant instead of a gas station? Some enterprising environmentalists have discovered that restaurants will gladly give away their used fryer oil, since they usually have to pay to dispose of it. This oil can be filtered and used to run cars and trucks that have been converted to run on vegetable oil. Your exhaust might smell like fries (no joke), but you’ll be recycling, emitting up to 70% less CO2, and saving yourself some money. The first thing to know is that only diesel cars can be converted to run on veggie oil. Diesel engines were originally designed to run on a variety of fuels, including peanut oil and vegetable oil. These engines work by injecting the fuel into a chamber of compressed air, where it ignites. Gas cars use a spark plug, which won’t ignite veggie oil.You should start with a diesel car that’s 15 years or older, says Farhad Ghafarzade, a veggie oil mechanic who works out of a garage in Portland with his associate Jeremiah and their two dogs under the company name Funhad. Older diesel engines had fewer moving parts, which makes them more reliable post-conversion. Ghafarzade converted his first car when he was in college studying molecular biology. He was able to buy a 1980 Mercedes at $400, but couldn’t come up with the cash for gas, so he decided to run it on grease from the dining halls (today FillUpForFree.com has a map of places where you can get pick up waste oil). Early 1980s Mercedes-Benz diesel cars are favored for veggie oil conversion because they are well-built and use fuel injectors that are tolerant of slightly thicker fuel. The actual conversion is fairly simple, but you have to be the kind of gearhead who is willing to do surgery on your vehicle. You will need to install a separate fuel tank and fuel lines for the veggie oil – you can’t just modify the diesel tank because a converted car will still use some diesel fuel. At or below room temperature, veggie oil is too viscous to run through a diesel engine, so the engine needs to run on diesel for about 15 minutes until the oil heats up. Therefore, you need to jigger some hoses to divert hot water from the radiator and circulate it through the veggie oil tank in order to heat the oil. The next step is to install a filter system to clean any reclaimed oil you want to run through your engine. You will want to pre-filter the oil before you put it in the tank, in addition to having the filtration system in the car. Diesel fuel filters usually capture particles up to 10 microns, but you can get filters that will catch 1 micron or ½ micron particles. 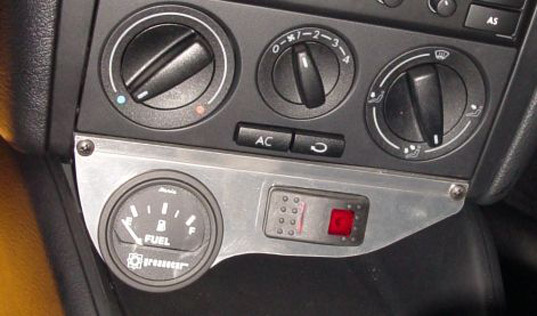 You also need to install valves that will allow you to switch from diesel to veggie once the veggie oil is warmed up and manual switch on the dash so you can activate the changeover, plus a temperature gauge to tell you when the oil is hot enough. You also need to purge the fuel lines of veggie oil by running on diesel a few minutes before turning the engine off. Last, you need a separate fuel gauge so you know how much is in your veggie oil tank. At Ghafarzade’s shop, the conversion costs $3,000 — $1,500 for parts and $1,500 for labor, although there are more expensive options for features like automatic shifting from diesel to veggie after the car starts up. But the mechanically-inclined can also purchase do-it-yourself conversion kits for as little as $595. That’s the supercheap option – kits from Greasecar.com and Frybrid.com run from around $1,000 to $2,000 for cars and $1,500 to $3,000 for trucks. Ghafarzade acknowledges that the conversion is easy, but one of his recent customers came in after a botched DIY attempt. The conversion had to be undone and redone. “The cost of you messing up is usually not worth your time,” Ghafarzade said. Critics contest that veggie oil is not as environmentally sound as some say. The Environmental Protection Agency> has said that running cars on vegetable oil, converting cars to run on vegetable oil, and selling vegetable oil for use in cars are all illegal activities that are punishable by fines: “Raw vegetable oil or recycled greases (also called waste cooking oil) that have not been processed into esters are not biodiesel, and are not registered by EPA for legal use in vehicles. In addition, vehicles converted to use these oils would likely need to be certified by the EPA; to date EPA has not certified any conversions,” the agency’s web site says. Ghafarzade says the EPA is concerned more about the government missing out on gas taxes than it is about emissions. And although the EPA says it intends to increase enforcement, Ghafarzade says he’s not worried about it because enforcement is so rare. It’s uncommon to get in trouble, but it still happens. A man in Charlotte, NC was fined $1,000 last year for using veggie oil. Bob Teixeira’s “100% veggie oil” sticker attracted the attention of state officials who were checking for illegal fuels. The state fined him for avoiding the $.299 cent per gallen gas tax and told him he needed to pay a $2,500 bond for small fuel users. In the end, the state compromised on the fine and asked legislators to waive the $2,500 bond. John Swanton, an air pollution specialist with the California Air Resources Board, told the LA Times that reclaimed grease modifications “tend to lengthen the lifetime of the older diesel vehicles that we would really just prefer be retired,” presumably because newer vehicles are made to comply with higher emissions standards. No, I like hempseedoil better! Id rather do it the cheap and easy way, breaking the law! Lye,Methanol and Hempseedoil just seems easier! 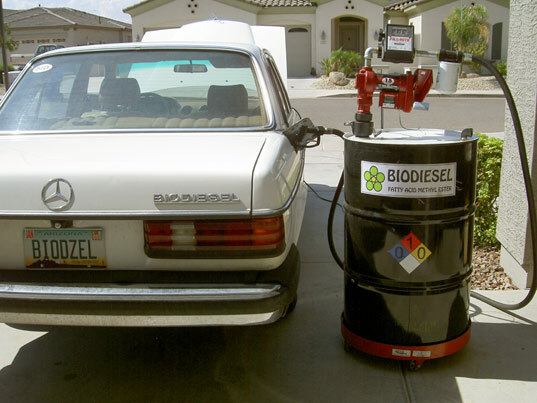 Interested in converting your car to run on waste vegetable oil yourself, but a bit nervous about tackling a DIY project like this? The Yestermorrow Design/Build School in Warren, Vermont offers a 2.5 day hands-on workshop entitled "Biofuels" which will take you through the process from start to finish. Tuition is only $300, and there are workshops coming up June 12-14 and August 14-16, 2009. More information at http://www.yestermorrow.org/courses/mmbs/biofuels.htm.